Oyster shucker Thomas "Uptown T" Stewart poses with oyster bar regulars Paula and Brent Coussou at Pascal's Manale. 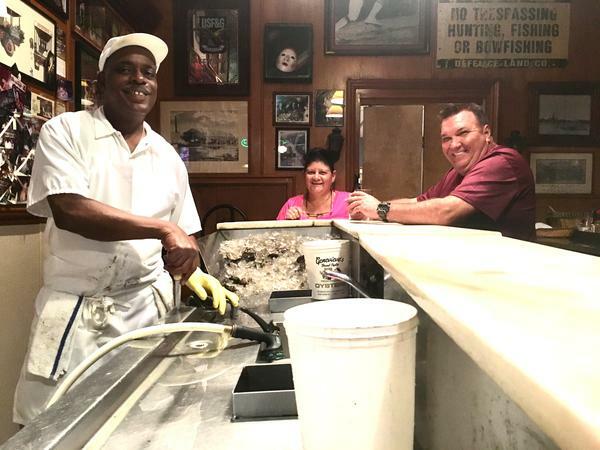 Thomas “Uptown T” Stewart is the famous oyster shucker at the Uptown New Orleans restaurant Pascal’s Manale. He’s worked at the restaurant for more than 30 years, and he knows his clients well. It seems like he’s always shouting “What’s happening, y’all?” to people walking through the front door. Stewart’s side of the bar is covered by a pile of raw oysters and ice. One by one he digs them out of the ice. He pries open the shells with a knife and slices the meat free with effortless speed. Brent and Paula Coussou are on the other side of the bar. They’re each nursing a beer and there’s a row of empty oysters between them. They say they’re regulars making the drive from Lafitte for as long as Stewart has been working there. I’m not sure if that’s an official term, or if he’s pulling my leg. But he’s referring to those crunchy bits of shell you sometimes slurp down with the raw oyster. Coussou heard the news about the politician who died, but he’s not worried. He says he’s never gotten sick. But of course, sometimes, people do get sick. And every now and then, someone actually dies. “There's always going to be a small amount of risk,” says Dr. Fred Lopez, who studies infectious disease at LSU’s Health Sciences Center. Lopez says the biggest danger comes from a bacteria called Vibrio vulnificus. That’s what allegedly killed the politician from North Dakota. And it’s actually everywhere. Vibrio vulnificus is a naturally occuring bacteria that thrives in brackish waters when the temperature is above 68 degrees Fahrenheit. As a result, it’s actually more common in the Gulf of Mexico where the waters are warmer -- compared to the East and West coasts. "If you're consuming a raw oyster that comes from the Gulf Coast waters...particularly in the summer months,” says Lopez, “You have to assume that it has Vibrio vulnificus." But, even though many oysters are exposed to Vibrio vulnificus, that doesn’t mean they’re dangerous to everyone. People with specific pre-existing health problems are most vulnerable. That list includes liver disease, diabetes, kidney disease, alcoholism, cancer, and people being treated with chemotherapy for cancer, and a few others. Generally speaking, people with weakened immune systems. Lopez says those people shouldn’t eat raw oysters -- period. Proper cooking kills the bacteria completely. All things considered,Vibrio vulnificus infections are still very rare. If you don’t have one of those pre-existing health issues, Lopez says you’re probably fine. It’s nothing to worry about. But in cases where people with weakened immune systems are infected by Vibrio vulnificus, anywhere from one-third to one-half of those people die. “That's a very high mortality rate,” says Lopez. There’s an old adage, that you should only eat raw oysters in months with an “R.” September through April -- basically the cooler months. So this isn’t a new idea. Moore says regulations have tightened over the last ten years or so. For example, during the warm summer months oysters that are meant to be eaten raw have to be refrigerated within an hour of harvesting. He says it’s had a positive effect. But, Billioux says even though infections from raw oysters are down, the amount of Vibrio vulnificus in the water is actually increasing due to warming waters. So, if you don’t have any vulnerable health issues -- slurp those raw oysters while you can. Or just toss ‘em in a deep fryer. Clarification: A previous version of this story referred to Vibrio vulnificus by the shorthand "Vibrio" in several places. Though the Vibrio bacteria family includes Vibrio vulnificus, not all Vibrio members are dangerous to human health. The the shorthand references have been made more specific.